#Breckenridge #Family Fun- it’s Rodeo Time in the Wild West! Never a dull moment in Breckenridge! And yes, Colorado is the Southwest, and yes, it has horses and cowboys, and… you guessed it! 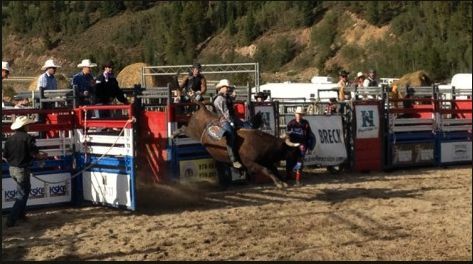 A real rodeo, the Breckenridge PRCA ProRodeo is sanctioned by the Professional Rodeo Cowboys Association (PRCA). Every Saturday and Sunday rodeo fans of all ages gather for this family friendly event on the north side of town at the arena to watch all of the roping and riding excitement. Breckenridge is also a great place for family horseback riding with miles of beautiful trails, crisp clean air and bright sunshine, and a great way to spend the day, picnic, and experience the majestic beauty of the Rocky Mountains. Breckenridge really does have it all with something for everyone. Family time in Breckenridge, unwinding away from big cities and high pressure with the people that matter most creates memories that last a lifetime for young and old alike. </strong></strong>just fill out the simple form below and we will get no obligation, no pressure information right back to you. This entry was posted on July 20, 2013 by elevatemarketingaz. It was filed under Breckenridge Colorado Luxury Condo Sales, Breckenridge Real Estate, Breckenridge, CO Real Estate, Breckenridge, Colorado Real Estate, Fractional Ownership Real Estate, Fractional Ownership Real Estate Breckenridge CO, Fractional Real Estate Breckenridge, Fractional Real Estate Breckenridge Colorado, Luxury Fractional Real Estate, Luxury Fractional Real Estate Breckenridge CO, Luxury Fractional Real Estate Breckenridge Colorado, Luxury Fractional Real Estate Summit County, Co, Real Estate Breckenridge, Real Estate Breckenridge Colorado, Uncategorized and was tagged with Breckenridge, Breckenridge Colorado, Breckenridge Colorado condos, Breckenridge luxury condo sales, Brent Henry Breckenridge real estate broker, luxurious condos.